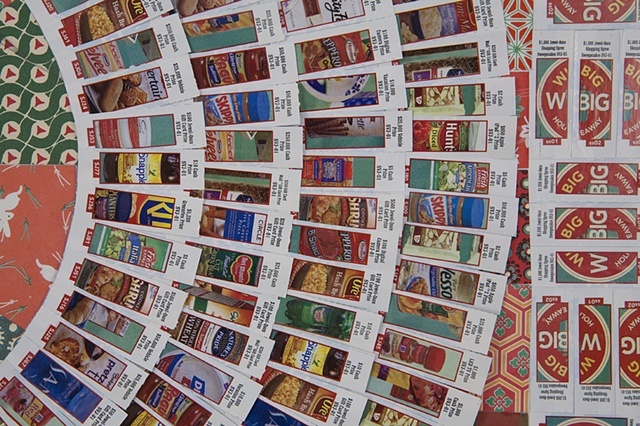 The Chicago-area Jewel grocery chain held a contest with tiny pieces that had to be cut out and glued to a game board. Sounds right up my alley, doesn't it? I spent many hours on this stupid contest and had my heart set on the big $250,000 prize. Needless to say, I didn't win anything, but I had zillions of little game pieces left over. Thanks to Kathy Anderson, Anne Eskra, and Rebekka James for giving me their game pieces too.